A new fighter enters the UFC roster, as Luis "Beicao" Ramos inks a deal with the promotion and replaces Mike Swick for UFC 134. Shooto’s 168-pound world champion – Luis “Beicao” Ramos – signs a contract with Ultimate Fighting Championship, and will make his Octagon debut against Erick Silva at UFC 134. The negotiation was not officially announced by the promotion, but it was confirmed by Nova Uniao leader — Andre Paderneiras. Luis Ramos will step in for Mike Swick, after the latter bows out due to anterior cruciate and medial collateral ligament injuries on his left knee. 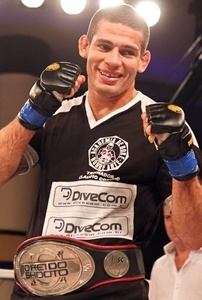 The 30-year-old fighter was defeated only once via unanimous decision by Roan Carneiro last October. Since then, Beicao boasts three-fight win streak. He also conquered Watch Out Combat Show’s one-night April tournament before recording a throttling of Dimitri Burgos last July 23. UFC 134 will take place on August 27, at Rio de Janeiro’s HSBC Arena. The said event will feature a middleweight title bout between Anderson Silva and Yushin Okami.